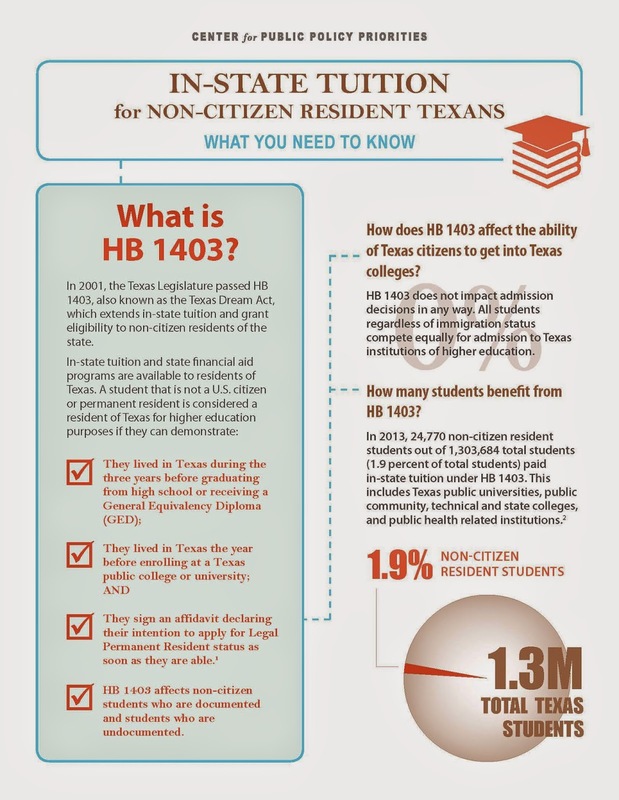 Here is the truth about in-state tuition for non-citizen, resident Texans from the Center for Public Policy Priorities—otherwise referred to as "HB1403" or the "Texas Dream Act." Texas, btw, was the first state to pass this in 2001 and was followed by California AB 540 and now a good number of states have it. This is good and just policy, my friends. Senate Bill 1819 by Senator Campbell et al. is a threat to HB 1403. Her bill mends state law so that a person unauthorized to be present in the United States cannot be considered a resident of this state for the purposes of receiving in-state tuition at a public institution of higher education. 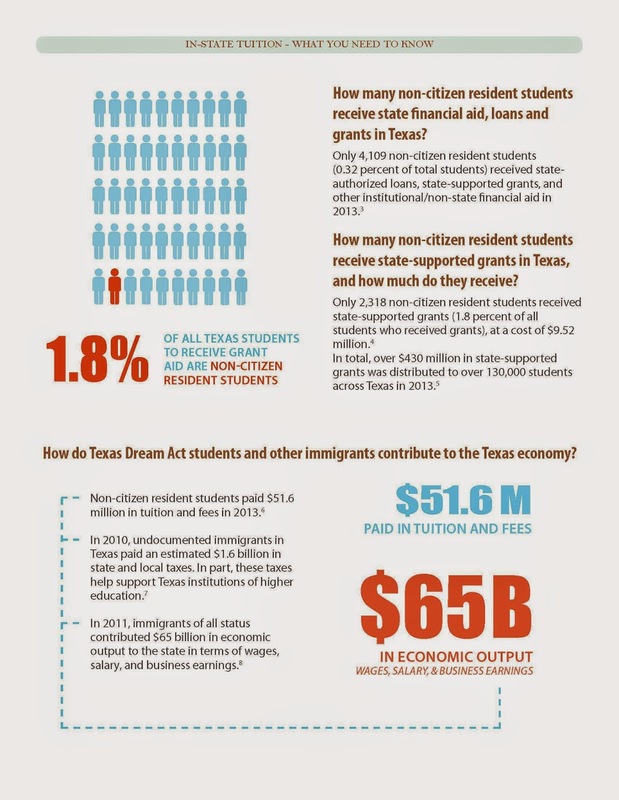 Undocumented students who currently receive in-state tuition at a public institution of higher education with at least 30 hours of credit before the 2015-16 academic year will be exempt from the changes. This bill will get heard on April 6th, at 8AM Veteran Affairs & Military Installations-S/C Border Security Committee (which, btw, offensively frames DREAMers as a security threat!) at the Texas State Capitol in 2E.20 (Betty King Cmte. Rm.). DREAMers and allies will be coming from throughout the state to challenge this. Get your voice heard, too. I think that there will also be a 10:30AM press conference outside the hearing room, too (will confirm). 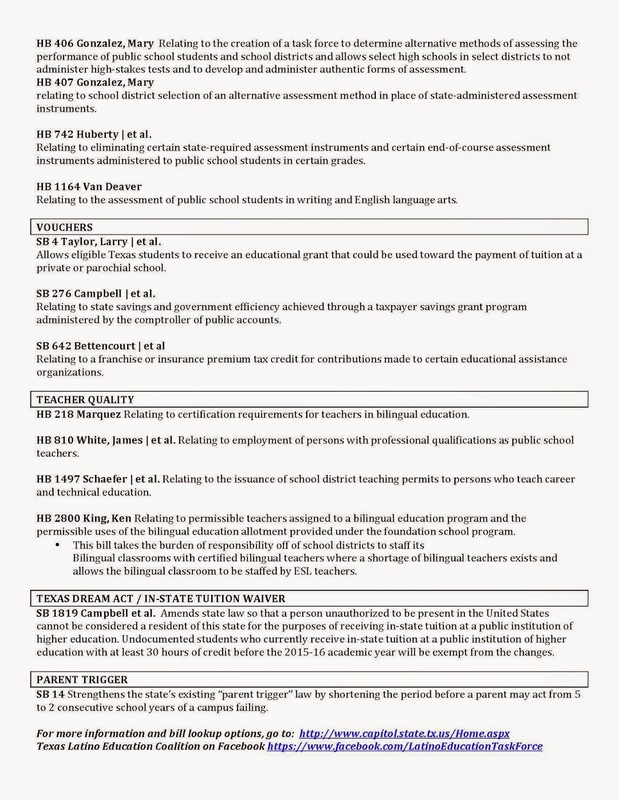 Here are the bills that were heard today in the Senate Education Committee in the Texas House of Representatives. Melinda Lemke and myself testified from a policy memorandum titled, "Will School Vouchers Benefit Low-Income Families? 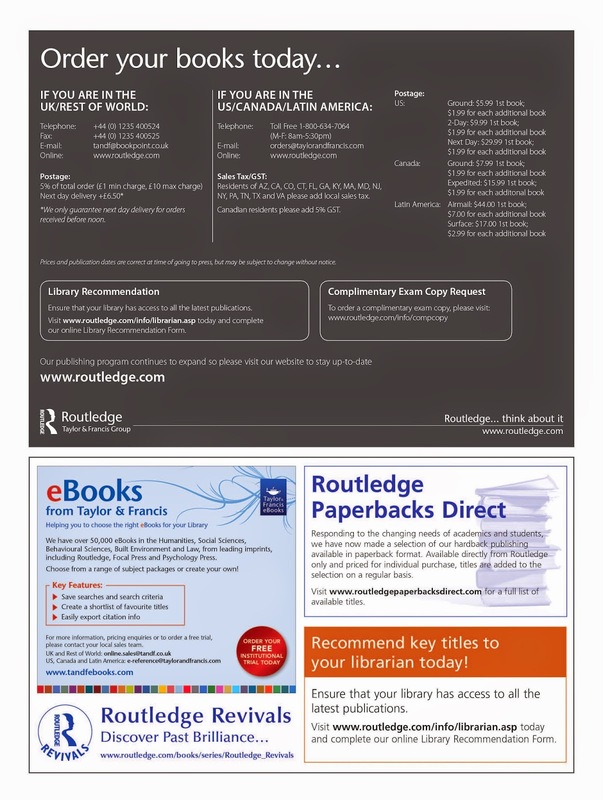 Assessing the Evidence" and co-authored by Dr. Huriya Jabbar, Dr. Jennifer Holme & doctoral students—Melinda Lemke, A.V. 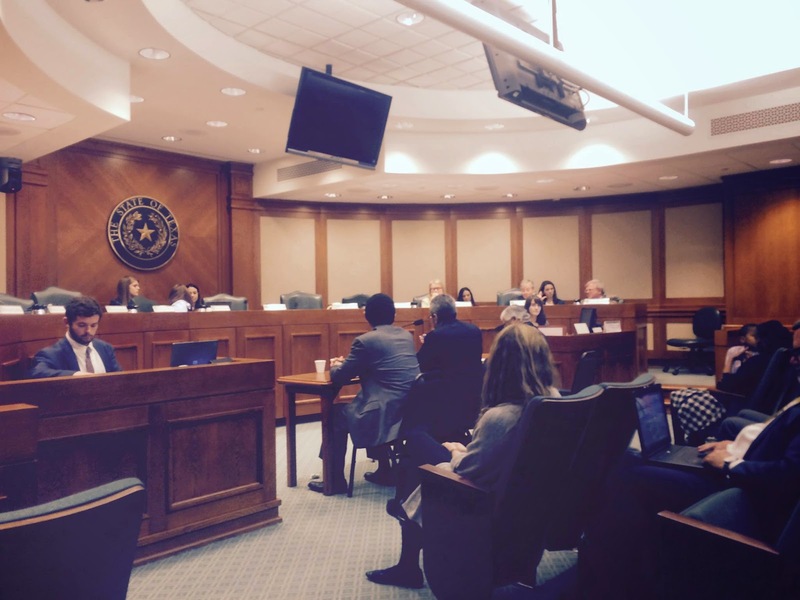 LeClair, Joanna Sanchez and Edgar M. Torres, Education Policy and Planning, University of Texas at Austin. 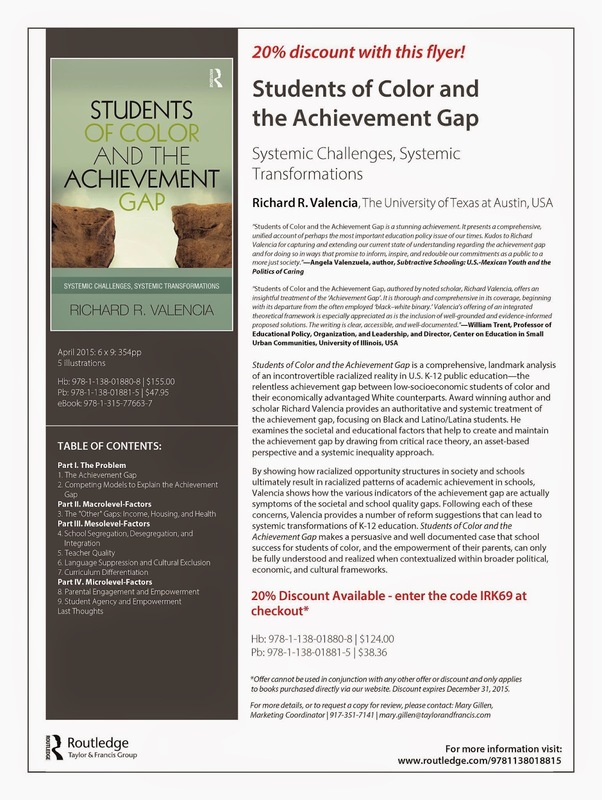 We find that the empirical research shows that the effects of school vouchers on student outcomes generally are small or insignificant, and do not have the ability to close the racial achievement gap or generate large gains in student outcomes. In addition, even voucher programs that target low-income families or those attending failing schools have serious access and attrition challenges, calling into question the equity claims of voucher proponents. We conclude that the research on voucher effectiveness shows mixed results—some studies show small positive effects on student achievement, and some show no effects. Overall these results do not align with the strong claims of voucher proponents. In addition, the take-up and attrition patterns of voucher recipients suggest that such policies might not benefit the most disadvantaged students. Not only does this rigorous review of vouchers suggest that we exercise caution if we are to construe this as a policy panacea, but it should also mean something to us that precious little peer-reviewed research on the matter actually exists which means that many questions about the effects of vouchers remain unanswered. It's important for us to consider all that we still do not know. Again, from a research perspective, we do not know what happens to children after they are no longer in a voucher program. We do not know whether when voucher laws are passed, exactly how the private sector (often parochial) schools prepare to meet children's needs. What happens to those places once children that use school vouchers leave them? We do not know from a public management perspective how state administrative bureaucracies manage dollars associated with potentially hundreds, if not thousands, of children moving in and out of the public and private sector. And what costs—especially hidden ones—are associated with this specific kind of management? All else equal, it sounds like an administrative nightmare. There are so many questions for which there exist little to no peer-reviewed data that we should exercise utmost prudence before we as a state go down this experimental path, particularly in the name of "progress," "freedom," and "choice." You may read the policy memorandum here. tuition at private and religious schools. four years ago and has yet to restore all of that funding. subsidize — directly or indirectly — private and religious schools. accountable to the taxpayers who are funding them. Coalition for Public Schools will point out today. You can watch a live-stream of the hearing here. We’re also live-tweeting the hearing: @tfn. Stay tuned. On the heels of South by Southwest, there has been a twisted conversation about race that Dr. Tane Ward sorts out here from his post on his blog. It works excellently with my earlier post this morning by Cecilia Ballí who speaks to similar issues. Austin needs to own its racism and classism and consider how these overlap and the damage that they are doing to communities. It simultaneously needs to recognize the breathtaking talent and beauty of the Latina/o and African American cultural arts community and how preserving and improving the very communities that have given birth to this art is not only a force for cultural and political power for these communities, but also a matter of self-interest to Austin's Anglo-dominant, middle- and upper-middle class community. 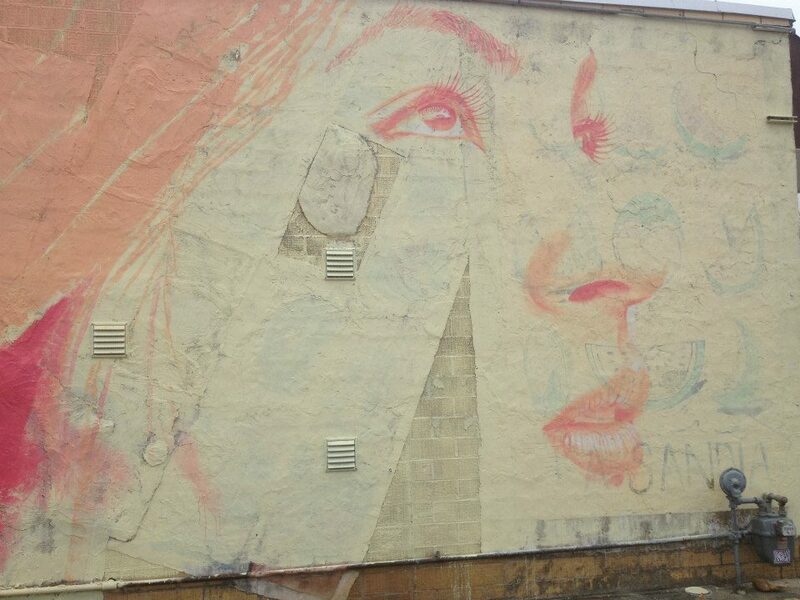 The changing complexion of Austin's future consumers of that art is an inescapable demographic truth. Rather than trample on the aesthetic contributions of our communities, respect and bridge building need to occur. We need community conversations around race, ethnicity, gentrification, and the arts so that we can develop policies and attitudes that do not bulldoze over the ethnic, multicultural landscape that has endeared visitors to Austin for generations. Simply put, aside from being about dispossession and disparagement, gentrification actually works at odds with the very kind of identity that not only makes Austin weird (as we pridefully say here about our city), but that also in the long run makes it profitable, beautiful, and a world-class city that is not only rich in its diversity, but prides itself on that. The satire clearly linked the historic institutional racism of Austin with the ongoing consumer-led gentrification and displacement on the East Side. This has stirred discourse in the city, but to a level, which falls short of what we are capable of. All the reaction from the media has been laughable. There is a disturbing collective feign of ignorance floating around about the intention and meaning of the art. Let’s not kid ourselves – it is a pretty straightforward message about race and gentrification. The flash issue obscures gentrification. There is a lot of gentrification happening in the city and it is partially fueled by SXSW. It would be great to see people take more responsibility in mitigating the negative effects that tourism and consumer-based economies have on historic neighborhoods. I would love the same engagement on revitalizing the East Side and holding exploitative City and capitalist practices accountable as I do from people reacting to relatively innocuous art. The same week, for example, a beautiful and historic mural on East Cesar Chavez was nonchalantly painted over by a foreign artist. The Lotteria mural is culturally significant to Cesar Chavez as a Mexican neighborhood, but as the makeup of businesses is changing, our culture is being erased. This was not covered on the news, and that layer of paint doesn’t peel off quite so easily. Neither does the displacement of thousands of people from their neighborhoods across the country. Another example is the demolition of Piñatas Jumpolín (see Dale Dale Dale postmarked 2/23/15) – a far worse act in terms of destruction and insensitivity, but one that was defended and as specifically “not racist” by many. Sadly, many people thought the stickers were made by White supremacists and to be taken literally. Geesh! I don’t know what to say. That would be like reacting the Right Wing ravings of Stephen Colbert. Austin Mayor Steve Adler called the act “appalling” and “offensive”. This comes from a mayor who made no public comment of the demolition of Jumpolín or the destruction of the Loteria mural. It seems like making White people uncomfortable is a greater sin than destroying the culture and heritage of historic Communities of Color (which is exactly the point of the stickers, so maybe Adler is really in cahoots with the artist and is just laying the satire on extra thick). Others mistook the stickers to be aimed at garnering ire toward the businesses and the city by framing them as overtly white supremacist. This was not an attack on the businesses or the city or the people associated with them. That some civil rights leaders took it there was an unfortunate diversion. The point was to imply that the City of Austin is racist as an institution, and businesses cater to specific class groups that follow racially segregated norms. There, that’s not so bad, is it? People misused the concepts of racism and hate-speech. People were really offended by the stickers and called them racist. One business owner called it “ hate-speech”. This messaging was also consistently and conveniently accompanied by a message of confusion – “why would they do it?” If you do not experience gentrification as a painful reality resulting in the displacement of your community or understand the racist history and current structure of our city, than you might not understand the point here. However, your ignorance does give you the authority to claim the status of a victim. Regardless of who owns or runs the targeted businesses – they are profiting from a system that is rooted in exploitation. That does not mean we hate you. Please stop pretending that pointing out social reality is hatred because it makes you feel guilty. 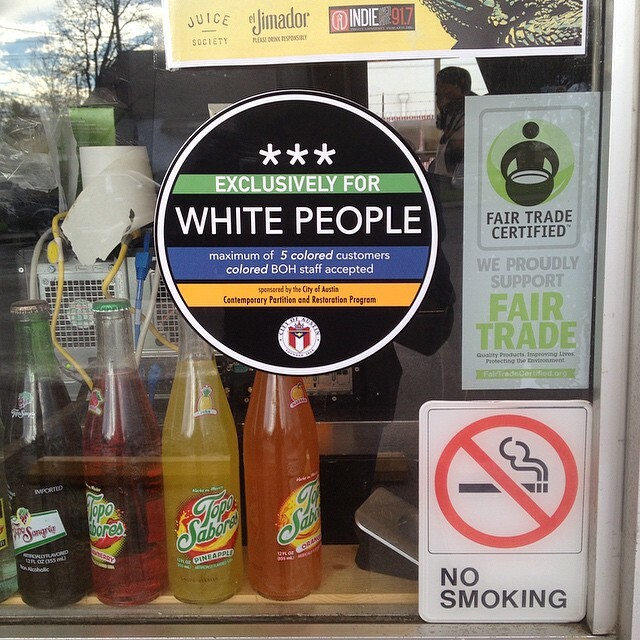 Racism is real and the stickers probably reflect a painfully accurate depiction of who patronizes these businesses. The weak response from POC community leaders is inconsistent with the political history (and I’m not sure why). Instead of Black leaders seizing the opportunity to bring attention to the plight of their communities and the legacies that have been mostly forgotten, Councilwoman Ora Houston, NAACP chairman Nelson Linder and Representative Dawna Dukes all responded with White protectionism. Completely out of touch, missing the satire and feigning ignorance of meaning and intention, the cadre of Austin’s old guard Black activist seemed to parrot the naiveté of the city’s rookie mayor. How disappointing that even when the door is blown open, these leaders failed to simply walk through it. Each of these three community leaders has been vocal on segregation, racism, gentrification and fair business practices. How could they have possibly missed the satire and the political opportunity to respond? Why when the clueless enactors of gentrification ask “but why?” do our POC officials not have such a simple answer? This makes the need for disruptive art/activism so important. How many Austin businesses have POC working in the kitchen and all White, or white-passing, servers up front? If you answered “probably most of them”, you are absolutely probably right. Racism is inequitable outcomes where there shouldn’t be. Mexicans are not naturally just better at washing dishes and Whites better at serving because they have fine breeding – no one really thinks that. No one really thinks they are racist either – but take a look in any restaurant in town and it is plain as day – real, live racism! I’m sure there are no business policies or city mandates for BOH/FOH racial segregation. The point is that there doesn’t need to be. Let that soak in before reacting. With all the horribly racist violence against People of Color, the cultural and historic racism in East Austin, the racist outcomes of profit-driven exploitation and gentrification and everything else POC deal with, can we have a simple joke? The stickers peeled right off. The fact a few little stickers are such a problem for people is harsh. Lighten up. This is a long haul and there is a lot of real work to be done to heal, undo racism and stop gentrification. Don’t fall too hard. It’s just a sticker – It’s not like somebody destroyed the neighborhood where you grew up. 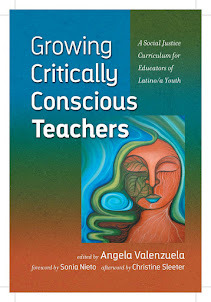 Thanks to Native East Austinites Andrea Melendez & Estrella de Leon for your strength and inspiration for this response. When I moved to Austin in the fall of 2008 to teach at the University of Texas, I was the envy of nearly everyone I knew. Wasn’t it the coolest city in the state? The country? Quite possibly the earth?! Yet still I was dragging my feet, which many Austinites found offensive (ever tried arguing with one about the superiority of any other place?). I’d lived previously in Brownsville, San Antonio, El Paso, and Houston, and I’d visited Austin countless times as a contributor to this magazine. But I’d always found it wanting in a way that was significant to me: it was the first place in my home state where I was frequently aware of my ethnic difference. Those other Texas cities had their own racial and class problems, sure, but they all had vibrant Latino communities, and they were cities where I could experience myself as both a Tejana and a Texan, an American who was Latina. By contrast, sometimes when I had lunch with my editor in downtown Austin I noticed I was the only non-white patron in the restaurant. 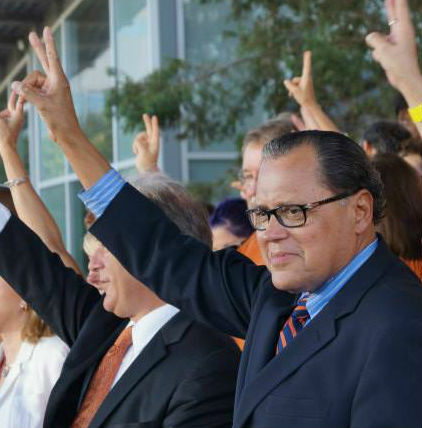 Things weren’t much better at UT, where the faculty was just 5.9 percent Latino (and just 3.7 percent African American). I had to ask myself, In a city where Hispanics made up over a third of the residents, why were they so hard to find? 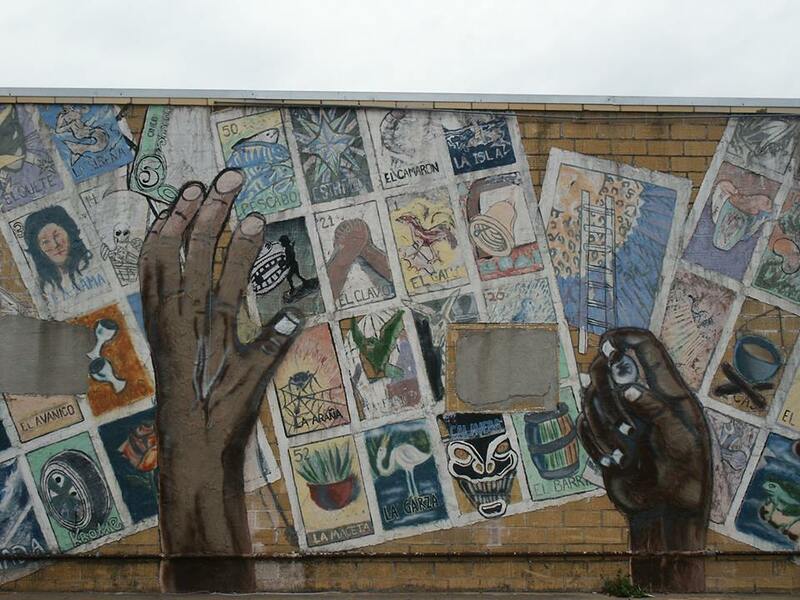 Austin prides itself on its cultural liberalism and sophistication, but given the invisibility of Latinos, it irked me that the city was obsessed with Latin American culture. Austin’s fixation with tacos and migas and queso (“kay-so”) seemed to me a way for locals to fetishize a world most of them didn’t regularly engage with. When I went salsa dancing downtown, a few times a white guy would sashay up to me with a sultry “ Ho-la, ¿quie-res bailar conmigo?” and I had to explain that I spoke English. I also felt persistently overdressed. When invitations called for “Texas chic” or “Austin cool,” I invariably wore the wrong clothes. Once, I showed up at a beautiful Hill Country ranch wedding in a long summer dress and stilettos when all the women were in knee-length frocks and sandals or wedge shoes they could manage the rocky grounds in. I’d never even worn flip-flops out of the house! I bought a condo in southwest Austin, in a neighborhood with a nice mix of natives and newcomers. For some reason, the area felt to me closer in spirit to the rest of Texas. On William Cannon Drive, I could drive a couple of miles west for lemon–poppy seed pancakes at Kerbey Lane Cafe or east for 99-cent barbacoa tacos at Las Delicias Meat Market. The development was still under construction when I moved in, and a crew of strictly Mexican workers was a ubiquitous presence during the first months I lived there. It was from them I learned about the great Austin divide and began to understand why I rarely saw any Latinos or blacks. A long-standing east-west geographic rift shapes race and class relations in the capital to this day. The workmen lived on the east side of I-35, where the city’s biggest concentration of minorities resides (Latinos make up 35 percent of Austin’s population, blacks 8 percent). The west side of I-35 was mostly white. This was where they came to work, and they literally kept their heads down while they did so. Was the state’s most progressive city also its most segregated? Austin’s geographic divide has a specific legal past. As I came to learn, African Americans had been living throughout the city in the early 1900’s, until a 1928 city plan proposed concentrating all services for black residents—parks, libraries, schools—on the East Side to avoid duplicating them elsewhere (this was in the time of “separate but equal”). Racial zoning was unconstitutional, but this policy accomplished the same thing. By 1940, most black Austinites were living between Seventh and Twelfth streets, while the growing Mexican American population was consolidating just south of that. For years Austin has held the dubious distinction of being the only major city in the country clinging to an outmoded model of elective representation that all but ensured its racial exclusivity would persist. Since 1953, members of the city council have been elected on an at-large basis, which means that residents vote for individuals to represent the city as a whole, not their own neighborhoods. Because levels of voter participation, not to mention money, are unequal from neighborhood to neighborhood, this has perpetuated a serious imbalance in who holds and influences power. In the past forty years, half the city council members and fifteen of seventeen mayors have been from four zip codes west of I-35, an area that is home to just a tenth of the city’s population. The few have been governing the many. The roots of this system are shameful. Until 1950, the system was straightforward: the top five vote-getters on a single ballot would become council members and select the mayor themselves. In 1951, a black candidate, Arthur DeWitty, then president of Austin’s NAACP chapter, came in sixth, which alarmed the city’s white business establishment. The system was rejiggered to create designated seats, or “places,” requiring more than 50 percent of the vote to win, a majority no ethnic candidate could achieve at the time. Not until twenty years later, in 1971, was an African American elected to the council, followed by the first Latino in 1975. At that point, forced to acknowledge the slowly growing political clout of minorities, the city’s establishment came up with an informal “gentleman’s agreement”: one spot on the council would be reserved for Latinos (Place 5, although later it became Place 2) and another spot (Place 6) for blacks. Though nothing prevented minority candidates from running for another place, they generally complied with the rule, since to do otherwise would disrupt the system, making victory unlikely. To date, no Latino or black has held a different seat. Over the weekend of February 26-28, students and faculty involved in the University of Texas-Pan American’s Mexican American Studies program attended the National Association of Chicana and Chicano Studies Tejas Foco (NACCS) conference in Houston, Texas. Throughout the weekend students and faculty facilitated and attended several research presentations as well as engaged with community efforts for social justice. While at the conference we learned that there was a statewide neglect of funding MAS in higher education and that in only a few weeks a day of advocacy at the Capitol would take place addressing issues of educational equity for Latina/os. 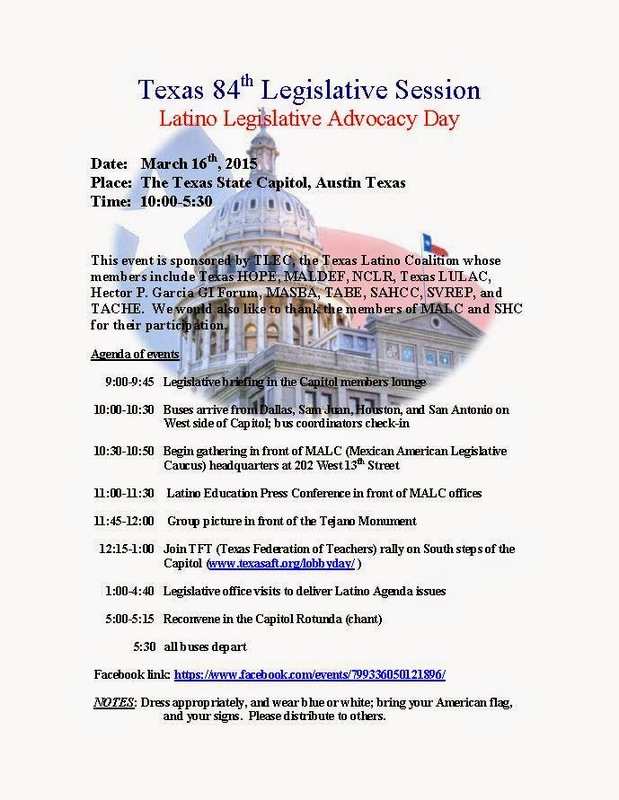 On March 16, 2015 approximately 50 students representing the UTPA Mexican American Studies Club (MASC), Bilingual Education Student Organization (BESO), La Unión de Pueblo Entero (LUPE) and the Minority Affairs Council (MAC) attended the Latina/o Education Day of Advocacy at the Capitol in Austin. Through the assistance of the Mexican American Legal Defense and Education Fund (MALDEF), the Hispanic Senate Caucus, and the Mexican American Legislative Caucus, students were bused to the Capitol to participate in a press conference by the Latina/o Education Task Force, rally their support, and meet with legislators. Our effort as students was advocating for the Latino/a Education Task Force agenda, in particular greater funding of MAS in higher education. However, our Valley contingency focused primarily on permanently funding the MAS Center, the Bilingual Studies Center, and the establishment of a department of MAS at the new UT-Rio Grande Valley. MAS has existed at UTPA since 1971, yet still exists today as only a program and not a department. UTRGV has promoted itself as a bilingual and bicultural intuition which boasts a Latina/o population upwards of 90 percent. However in the UTRGV Legislative Appropriations Request there exists no special requests to fund MAS. Today only a single MAS department exists in the state. In order to develop politically conscious and socially aware Latina/o leaders it is imperative to fund not only a MAS Center, but also a department in the Valley. We believe we have the potential to become the premier MAS department in not only Texas, but in the nation. Our sentiments were met with vocal support from our legislators. This support is additional affirmation to our ontological vocation of preserving our history and determining our future. To not create a MAS department after 45 years of existence is to say that the study of the Mexican American experience is of little value. Who will be the legislator to champion our cause? Or will it be the student activism, as it was in 1971, that brings the permanent funding of a center and the rightful establishment of a department dedicated to the study of our Mexican American communities? One thing is for certain, we will not stand idly by while crossing our arms as our heritage and culture escapes yet another generation. Nuestra Educación Es Nuestra Lucha. Editor’s Note: The main photo with this story was provided by Roberto Calderon of the UT-Pan American Mexican American Studies Club. It was taken on the south steps of the state Capitol on March 16, 2015. Charters have a limited admissions policy, and the applications can be as complex as those at private schools. But the parents don’t pay tuition; support comes directly from the school district in which the charter is located. They’re also lucrative, attracting players like the specialty real estate investment trust EPR Properties EPR +1.89% (EPR). Charter schools are in the firm’s $3 billion portfolio along with retail space and movie megaplexes. Among the big donors: the private equity firm Apollo Group APOL +3.8%, the outfit behind the for-profit University of Phoenix, which has experimented with online high schools. Apollo dropped $95,000 on Florida candidates and committees. Senator José Rodriguez lays out here why this bill is both bad policy and inhumane. Senator Jose Rodriguez outlined reasons why SB185, the so-called “sanctuary cities” bill, is bad public policy. While it’s been delayed, chances are it will be brought back up by the committee. This bill, a rehash of legislation that was defeated in 2011, is simply bad policy and bad business. I’ve summarized six major points that illustrate why it’s such a time-waster for a Legislature that has important business to take care of — budget and taxes, education funding, access to health care and other key governance issues. 1. It seeks to solve a non-existent problem. There is no indication that local law enforcement needs this authority, which is reserved exclusively for the federal government, to keep communities safe. Quite the opposite, as point number two illustrates. I find this particularly ironic given that it’s being put forth by representatives who claim they are for small government. 2. It harms public safety. In 2011, this legislation was overwhelmingly opposed by county sheriffs and police chiefs. El Paso County Sheriff Wiles spoke out against this legislation because as he stated it would undermine his ability to work with immigrant communities and effectively combat cartel activity. Austin Police Chief Art Acevedo and many others made similar comments. 3. It’s bad business for Texas. Similar legislation in Arizona cost $5 million in lost taxes from SB 1070 and $135 million in lost economic output. We can’t afford to lose current business or future investors. It also does not make sense to drive workers away from labor-intensive but critical sectors such as construction and agriculture. 4. It targets children. While SB 185 exempts school officials, it includes school peace officers. I’m not one who thinks it makes sense to punish children who are in our communities, regardless of documentation, by pushing them out of school and into the streets. 5. It has legal implications that don’t appear to have been thought through. It will inevitably lead to racial profiling. It is likely to lead to violations of the Equal Protection Clause, the Supremacy Clause and the Fourth Amendment. In fact, the issue already came up in El Paso County, where the El Paso County Sheriffs Department was sued for pulling passengers off a bus and asking them their immigration status; the lawsuit was settled when the department agreed to establish a written policy and train its officers. Further, it places schools in an untenable position: If their peace officers do not ask immigration questions they could lose state funding, and if they do ask they could be sued in federal court. 6. It hurts families. So called “sanctuary cities” policies have the potential to divide mixed-status families in Texas. Leading faith leaders opposing this legislation in 2011 including the Catholic Conference of Bishops, the Christian Life Commission, Texas Impact, the National Council of Jewish Women, the Anti-Defamation League, Evangelical Pastors, and numerous other religious orders and clergy members. Only a few days ago, President Obama, in his Selma speech, reminded us of one of our country’s enduring sources of greatness, immigration. The United States of America still is the world’s greatest destination for those yearning to breath free. We need to fix our system to reflect that reality, not punish those who have risked everything to be here. SB 185 is the "show me your papers" bill. Sounds like SB 1070 in Arizona, right? Yes, this bill reflects the political will of the bigots in our state and state leadership. I know that lots of folks are out on Spring break —and that's exactly when so many of the truly toxic and/or racist bills surface—because legislators that are zealous to railroad an agenda know that the community is either out of town or distracted by SXSW. If you happen to be around, please make your way to the Texas Capitol on Monday morning and participate in the Texas Latino Advocacy mobilization, and the Texas AFT rally from 12:15-1:00PM on the South steps of the Texas State Capitol , too (see earlier post) to exercise your constitutional right to assemble and protest this injustice—and to advocate for adequate and equitable school finance, as well, while you're at it. Equitable school funding is one of the most important civil rights issues of our times—in terms of both adequacy and equity. This must further be understood in the context of a growth in child poverty, the attacks on the teaching profession to "teacher-proof" our schools, and our current high-stakes testing context that shames and blames schools and in so doing, paves the way for charters, vouchers, and marketization. In Pennsylvania, for example, millions of dollars in state budget cuts to education during the past several years have contributed to a funding crisis in Philadelphia, a high-poverty district where many schools don’t have full-time counselors or nurses, and where parents contribute funds to help buy such essentials as paper. A spokesperson for Pennsylvania Gov. Tom Wolf (D) did not respond to requests for comment about the disparities. Wolf was elected in November 2014 after making education a central platform in his campaign, promising to increase state spending on schools and to address inequities. Wolf recently proposed spending an additional $2 billion on public schools during the next four years and has been touring the state’s public schools. A spokesperson for Missouri Gov. Jay Nixon (D) also did not respond to request for comment. Talbott said state officials couldn’t pinpoint the reasons for the two different findings on short notice. In general, wealthier towns and counties are able to raise more money through taxes to support their schools than poorer localities can. Many states have developed school-finance systems that send extra dollars to poorer areas in an attempt to mitigate those inequities. But the state aid is often not enough to make up the difference. Federal spending — including through Title I, money meant to bolster programs for poor children — is serving as an equalizer, according to the federal data. When federal dollars are included, just five states are spending less in their poorest districts than in their wealthiest. Nationwide, the average disparity drops from 15 percent to less than 2 percent. But federal spending was never intended to equalize funding for poor children, Duncan said. It was meant to add more money for students who need more services. In 23 other states, students in the poorest school districts are getting more state and local tax dollars per pupil than students in the most affluent districts. The differences are biggest in Indiana and Minnesota, which respectively spend 17 percent and 15 percent more in their poorest districts than in the most affluent. Federal spending boosted expenditures in the poorest districts significantly in both Indiana (25 percent more than affluent districts) and Minnesota (21 percent more than affluent districts). The graph below shows funding differences between school districts for each state, with the ability to look at just state and local funds and also funding that includes federal dollars. Negative percentages mean that students in the state's poorest school districts get fewer dollars per pupil than students in the state's most affluent districts. Positive percentages mean that students in the poorest districts get more dollars per pupil. Three states (Colorado, Iowa and Utah) provide essentially the same funding for the poorest and wealthiest school districts, with differentials of less than half a percent. The federal analysis does not include Hawaii or the District of Columbia, since in each of those jurisdictions a single district comprises more than half of the student population. 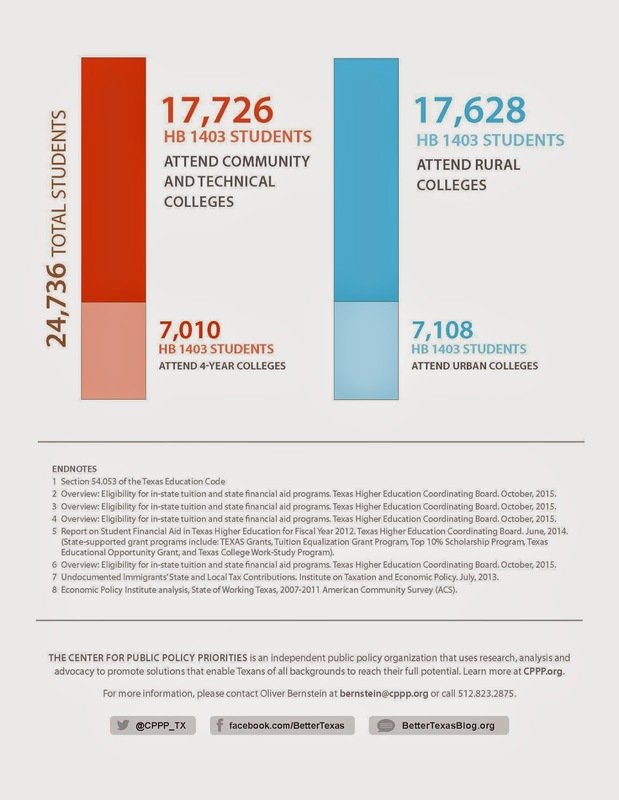 The National Center for Education Statistics released the data on its Web site last month. The figures are based on poverty data from the U.S. Census Bureau and financial information reported by school districts. The data sheds light on the wide variation in education spending among states as Congress is trying to rewrite the main federal education law, No Child Left Behind. Much of the debate about the law has centered on its standardized testing requirements, but teachers unions and many advocates and Democrats see the law as the federal government’s most powerful tool to improve equity among schools. The Obama administration wants Congress to add another billion dollars to Title I, a $14 billion program. The National Education Association, the nation’s largest teachers union, wants the law to require schools and districts to publish an “opportunity dashboard” that would shed light on how much access children have to the kinds of resources many parents want, including arts and sports programs, nurses and counselors, and advanced coursework. House Republicans included neither of those proposals in their bill to rewrite the law, the Student Success Act, legislation that the Obama administration has said would devastate schools in the poorest communities. The House began debate on its version of the rewritten legislation last month, but postponed a floor vote. The Senate has plowed ahead with bipartisan talks between Sen. Lamar Alexander (R-Tenn.), the chairman of the Senate education committee, and Sen. Patty Murray (D-Wash.), the committee’s ranking member. Alexander and other Republican leaders in Congress want to shrink the role of the federal government, giving states far more latitude to decide how to spend federal dollars and address struggling schools. But many Democrats and civil rights groups want the federal government to have more control in order to ensure equity among schools and students, arguing that some states, if left to their own devices, would ignore the needs of poor and minority children. Alexander also is pushing for a policy called “Title I portability,” which would allow federal Title I dollars to follow low-income students as they move from school to school. The Obama administration and many Democrats, including Murray, argue that such a policy would exacerbate funding inequalities between the poorest and wealthiest communities. Asked to address the concerns about civil rights and Title I portability in light of the new federal data showing spending inequities in poor school districts, a spokeswoman for Alexander said that conversations between Alexander’s and Murray’s staff continue. “This is one of several questions staff are addressing together,” she said. 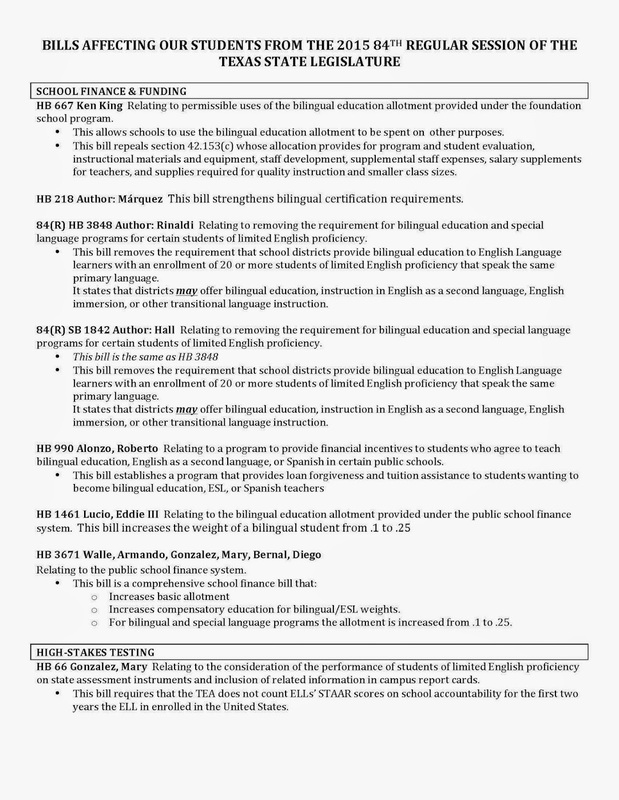 The Senate education committee is expected to mark up a bipartisan draft during the week of April 13. 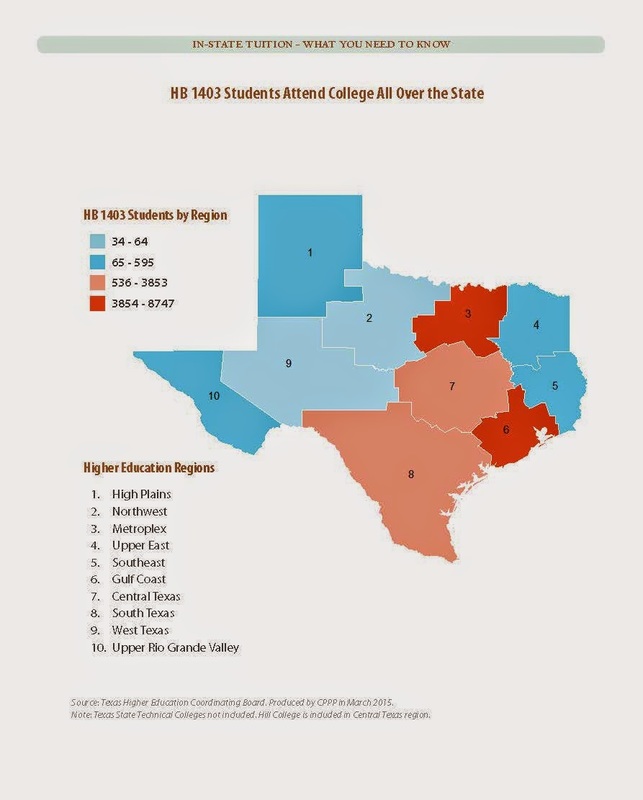 Is Texas Southern, Western, or Truly a Lone Star?